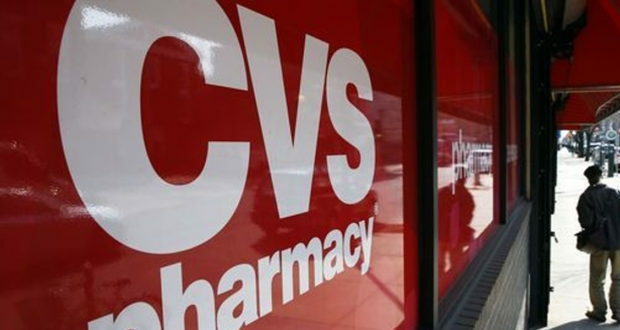 CVS and Aetna issued a joint statement over the weekend that the pharmacy retailer would acquire the health insurer for approximately $69 billion. This acquisition is subject to regulatory approval and it seems as if it should be approved, but there isn’t a great deal of history with the current administration on how they will rule on such acquisitions. Regardless of whether it is approved or not, one can’t help but view the move by CVS as a proactive move rather waiting to see if Amazon enters the retail pharmacy space. After Amazon agreed to acquire Whole Foods back in the summer, all retailers had to be thinking, “How can we protect ourselves?” Amazon has already expressed an interest in entering the space with the thought of delivering pharmaceuticals through their vast online-retailing presence. It could also be considered a proactive move as many experts expect cuts to Medicare after the new tax bill is signed. There is also the matter of the Affordable Care Act and the Republicans’ attempts to repeal it. No matter how you look at it, all aspects of the healthcare industry are changing and CVS and Aetna are viewing this as an opportunity to get ahead of the curve. So what will be the benefits and consequences to the public? Supporters of the merger argue that the joint company that offers insurance, health care and pharmaceutical delivery to patients will be a means of bringing down costs to patients. Those that oppose the merger are worried about possible limitations to patients as the joint company could potentially act to limit choices. For instance, Aetna could force patients to use CVS clinics or CVS pharmacies. In theory, a one-stop shopping facility for healthcare could bring down costs, but history suggests otherwise. As choices for insurance or pharmaceuticals diminish, prices typically rise, that is a basic principle of economics. With our society aging, the need for healthcare isn’t going to go down and therefore the demand will continue to increase. Increasing demand for a product or service that has few suppliers is the exact recipe for price increases. In the beginning, the sharing of costs could potentially bring down costs, but if the merger is successful, we will likely see additional mergers between insurers, pharmacy retailers, healthcare facilities operators and so forth. While this would bring competition to the CVS/Aetna operation, it could still result in fewer choices for patients. We could see a merger of say Walgreen’s and Cigna, Wal-Mart and UnitedHealth Group and many others. The expectations are mixed on how the justice department will rule on this proposed merger, some see it as an easy approval while others see it being challenged due to the reasons presented above. One possible area from the past that the justice department might want to review is the case of Health Maintenance Organizations and how pre-arranged networks for medical care have worked. Since the HMO act was signed by President Nixon in 1973, healthcare costs in the United States have risen much faster than the overall rate of inflation. 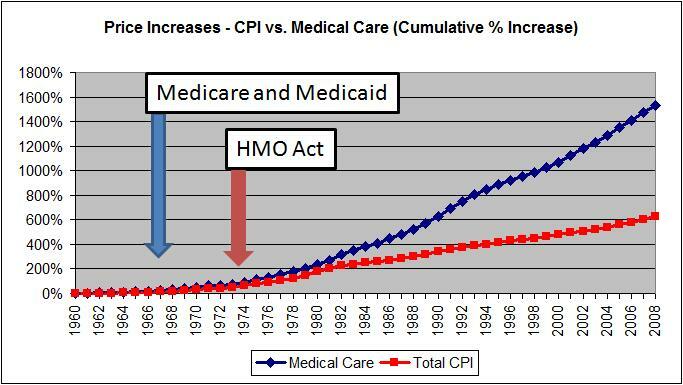 The following chart is from an article from American Thinker and it shows how medical care has increased compared to overall CPI. The HMO act was the beginning of networks of health insurers, doctors, clinics and hospitals working together and you can see how it has had the exact opposite impact that it was intended to have. Of course there are other factors at work beyond the advent of HMOs, but one can’t help but wonder if the idea of insurers working with providers isn’t contributing to the exponential rise in medical care costs. Do we really believe having pharmacies joining the networks is going to bring costs down?